Yesterday I finalized the selection of images that will appear in my forthcoming book, Remembering the Battle of the Crater: War as Murder. Readers will recognize a number of them, but many will be published for the first time. They include images of the 1937 Crater reenactment that appeared in Richmond newspapers as well as a wonderful postwar image of the Griffith House, which housed a small collection of artifacts and at least one member of the family into the twentieth century. William Griffith’s decision to preserve the area around the crater ensured that it would not be lost to development. I am not exactly sure where this is on the battlefield, though I am pretty sure that these are Confederate lines adjacent to Elliott’s Salient, where the explosion took place. There is another image of the skulls that will appear in the book, which can also be found in Earl Hess’s recent study, Into the Crater: The Mine Attack at Petersburg . The image above did not make the cut, but I wanted to share it with you because it represents such a sharp contrast with some of the more popular images of the landscape, many of which focus on the crater itself. These early postwar images help us to imagine a lost landscape that has yet to be shaped by encroaching trees and the effects of a manicured 18-hole golf course that was in operation briefly in the 1920s. If you look closely you will see at least one black individual. Former slaves were a common sight on the battlefield collecting human remains for which they were paid based on weight. Kevin; My interest in the Civil War stems from the fact that I oppose War in general. Does you book include the number of soldiers who were killed by the explosion that created the Crater? I have no doubt that racism played a part in what happened, but I also think that having been close to this massive explosion would have had some effect on all of the participants. I briefly mention the numbers, but since this is not a traditional battle study I do not go into exhaustive detail. I certainly agree with you that the scale of the initial explosion helps to explain the level of violence witnessed at the Crater. At the same time it is important to keep in mind that plenty of fighting took place away from the site of the explosion. Our popular images have us focused on the men who found themselves trying to make their way through the crater, but a number of Federal units managed to sweep around to engage Confederate forces along the lines adjacent to Elliott’s Salient. I’ve said before that I think the emphasis on training has been blown out of proportion. Yes, the black units drilled before the assault, but keep in mind that this was their first real taste of battle so some kind of preparation was necessary. A few regiments did spend time on maneuvers that would steer them clear of the explosion, but this does not seem to have occurred throughout. Something that few studies emphasize—and I understand this kind of tactical issue is not your focus, Kevin—is the level of difficulty associated with moving troops, in an organized fashion, using the linear tactics of the day, through the maze of entrenchments to either side of the Crater; Slotkin’s book was the first that touched on it. A second issue was that no one person was in command at the actual fighting front. Burnside never went forward, and only two of his four division commanders did. 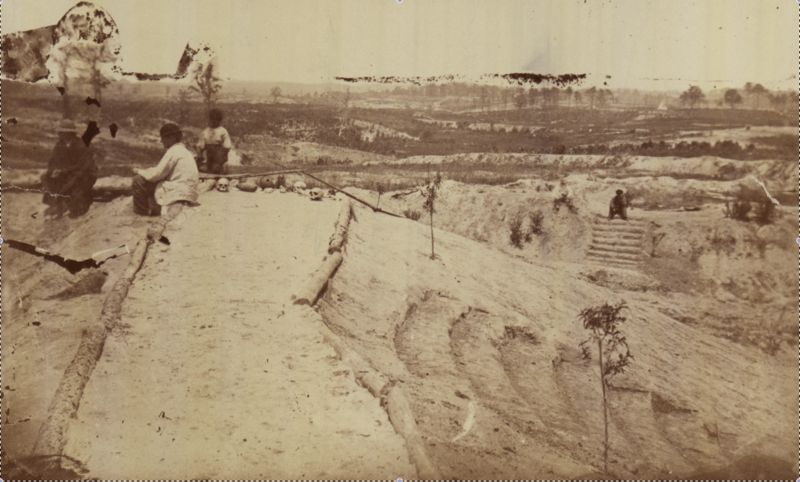 Both the complexity of the entrenchments and lack of leadership on the battlefield clearly shaped the nature of the fighting as well as its outcome. One of the reasons I love this particular image is that it gives us a much more accurate view of landscape. I did a paper on college on black troops at the Crater. This makes me want to dig through my paperwork and find it.